I have had several questions from people who are considering mirrorless options for sports photography so I put together this post to discuss some of the pros and cons of this decision over the DSLR setups. First, let me disclose that while I do own a mirrorless camera, I use a Canon DSLR and a variety of lenses for my primary photography, including sports. Saying that, I can offer a number of observations as an experienced photographer for those wanting opinions about mirrorless options for sports photography. In general terms, one of the obvious advantages of the mirrorless cameras is their smaller size and weight. That’s not a small concern as lugging around the heavier equipment all day gets tiring, especially as one gets older. Their image quality and performance have significantly improved to the point that converting to mirrorless is a viable consideration, particularly if you are a landscape or portrait photographer. The autofocus capabilities are very responsive but the professionals that I know are not convinced that, on average, they are as good as the DSLR’s in their camera bag. Note, the very top models (e.g. SONY A9) may have caught up but their prices are as high or higher than the DSLR’s. So, whether the average mirrorless options are as good for sports is a question I cannot definitively answer, particularly indoor sports. I can say that my mirrorless camera’s autofocus system (in terms of tracking a moving subject) is not as good as my DSLR but I also have an older mirrorless camera so today’s cameras are bound to be better. At present, one of the most obvious disadvantages is cost. Canon recently came out with a great mirrorless option but when I looked at the price of that and it’s accompanying lenses, I was done. It wouldn’t make sense for me financially. I know I can use an adapter to use my ef lenses on the mirrorless camera but if reducing size and weight is the objective, what’s the point? With those general observations, lets focus on some of the better mirrorless options out there and discuss some of their strengths/weaknesses as they relate to indoor sports photography. I will particularly make my observations as it relates to photographing indoor volleyball games, though the same would be applicable to basketball, hockey, or any other indoor event. Unlike professional indoor venues that are very well lit for television purposes, most will be photographing in gyms with very poor light and this will dictate the need to use fast lenses (f/2.8 or faster) and higher ISO settings (e.g. 3200-6400). 693 AF (autofocus) points, makes it very responsive so it can track a subject. Users report it locks on a subject but often for a split second so real-world tracking may be useable, but perhaps a bit less reliable. 10 fps continuous shooting at 24mp for up to 89 images in RAW format. Actual usage closer to 8 per owners of this camera. Battery rated at 400 images. Again, actual usage is significantly improved. The two lenses above should cover most any indoor photographic need. There are other options that one could chose that may be more affordable. For example, one could select a faster prime in a desired focal length (e.g. 50mm on crop factor camera or 85mm on a full frame). Alternatively, one might select a 3rd party lens in the desired focal length. Below are a few alternatives worth considering. There are some excellent f/4 lenses in the Sony lineup that are solid performers; but again, given the poor lighting conditions of most indoor gyms, I do not think these are real options. Using an f/4 lens is going to force one to use high ISO settings in the 6400+ range and this introduces a significant amount of noise to the image. It’s useable and can be cleaned up in post processing but starting off with a cleaner file is best. If one is shooting outdoor sports, then these f/4 options become significant considerations and their f/4 aperture offers a cost savings relative to the more expensive f/2.8 lenses. Mirrorless cameras–is it their time? For me, not yet. I’m not sure if they ever will be given my significant investment in current Canon glass. I’ve always been intrigued with the Olympus micro 4/3 camera setups and their pro lenses (12-24, 40-150, and 300mm), but at their prices, I am better off simply investing in better glass for my current DSLR. The full frame sensor on the Sony mirrorless cameras has also always been enticing but for me, none of these options make sense. If you are starting out, or if physical conditions dictate that you need a smaller/lighter system, then mirrorless cameras may just be the best option as camera manufacturers seem pretty dedicated in continuing to expand the performance of these camera systems. Their performance today is impressive so look for continued improvements in the years ahead. I hope this post has been useful. If you want to consider traditional DSLR systems, check out my gear recommendation page for my input on the various Canon cameras and lenses that I use. I’m selling a Like New Cokin Z-Pro Filter Holder for anyone who is interested. I’ve used it just a few times but I’ve decided to clean house on some of the items I rarely use. I’ve attached a stock photo and have foregone the description as chances are, you know exactly what this is used for. $60 shipped in continental USA. I’ll be back with some new images soon. Until then, good light and keep shooting. This Mexican Ground Squirrel provided a most pleasing pose at one of the water holes located at the Campos Viejos Ranch. They are constantly on the alert and the sound of the shutter caused this fine specimen to pause as if to momentarily say….”one more click and I’ll jump”. Campos Viejos is a premier hunting and photography ranch in South Texas. For further information about photographic opportunities there, contact ranch owner Hardy Jackson. A few weeks ago I made a trip to Bonita Springs, Florida. I have to say Florida did feel like a bird photographer’s paradise as everywhere I went, photo opportunities presented themselves, whether that was at nearby Ding Darling NWR or simply a spot by the road where wading and shorebirds gathered to hunt during low tide. On this particular afternoon I visited Lover’s Key State Park with the intention of hiking one of their marsh trails. However, I changed my mind at the last minute and decided to photograph on the beach at Lover’s Key instead. I knew terns and skimmers were nesting on the beach and I hoped to get some images of them flying by. Before anyone starts to wonder, I never made it to the nesting area on this afternoon but I did another day and yes, I kept my distance from the nest area itself. The nest area is roped off to keep people from disturbing the birds on the nest. However, it is a public beach and people can walk right up along the rope. In my opinion, that’s still too close as the birds will feel threatened and give you a flyby (witnessed it several times over the course of a few days). But that is a story for another day. Let’s get back to the image in this post. As I mentioned, I was on my way to photograph the terns/skimmers and was carrying my tripod mounted 500mm lens slung over my shoulder across a bridge/boardwalk connecting Lover’s Key to the beach. When I reached the part where the bridge met the sand, I was greeted by this Osprey clutching a fish and settling in to start dining. Shocked, I feared my movements getting the tripod off my shoulder and legs spread would cause the Osprey to fly away. To make matters worse, I heard someone saying “behind you, behind you” as I was trying to spread the tripod legs. It turned out to be a lady on a bike and she was none to pleased that I had not moved out of her way, specifically that I did not move to my right because the bike rack was to my left. 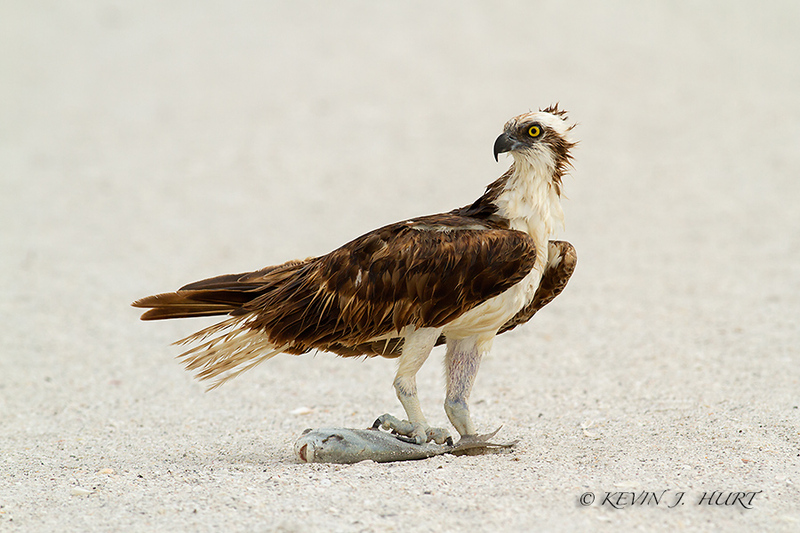 Now I really feared the Osprey would take flight given her noise and movements but to my good fortune, the Osprey’s attention was fixed on the fish since it was still alive and flopping. With the lady now gone, I began taking images…lots of images. I took some insurance photos from a standing position but I knew the best perspective would be low to the ground so I eased my way into a low kneeling position and fired away. I would capture some images from the prone position as well but thought the low-kneeling images were best given this location and backgrounds. To say the least, lady luck was with me on this particular afternoon.